Completed Grade 8 Drum Kit from Trinity College of London. Learning Drums since 10 years from Sukumar babu, Bangalore. 5 years of teaching experience. 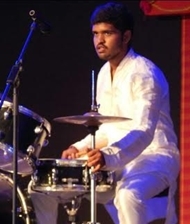 Teaching Drums in different Institutes and Academies in Bangalore. He plays different percussion instruments.